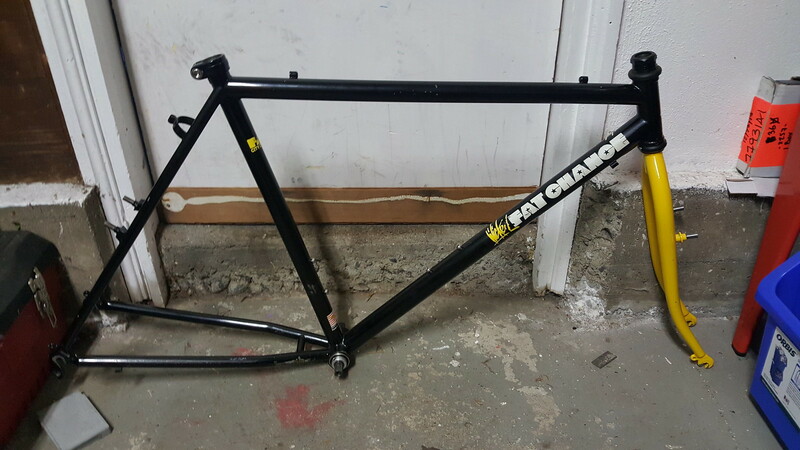 I recently traded for a really nice black Wicked frame w yellow decals and a yellow unicrown fork. I was told it was 19.5" frame, but I'm not 100% convinced. The seat tube measures 19" c2c, and 20.5" center to top. I can't tell the serial number without drilling out the riveted plastic cable guide under the b.b., though I can see the serial number ends with "...8W". Does this seem odd to anyone? I thought a 19.5" frame would be 19.5" c2c on the seat tube. The frames were measured from the BB to the top of the top tube, the 19.5 sounds correct. Oh that's the first time I have heard that, if so that solves the 'mystery'. Thanks Retro Dude! When viewed from the side the 19.5 Wicked (and Fats and Team Comps for that matter) will have a horizontal top tube - pretty much level with front and back tires that are the same size. There will be a small space on the back of the head tube between the top tube weld and the down tube weld - my guess about 3/8" (10mm). On the 18" Wicked, Team and Fat, the top tube slopes back toward the seat tube. This is more pronounced on the 16.5s. The top tube and down tube welds either touch or have a very small space between them on the head tube - maybe 1/16" or less (1 mm or so). Team Comps may have a bit bigger space between the top and down tube welds since the Prestige down tube was 1.25" diameter and the Wickeds and Fats used the True Temper 1.375" diameter down tube. The 18s, 16.5s, 15s (rare) and 14s all used the same head tube. The 19.5s, 21s, and 23s all had their own unique length head tube. Thanks Mr B., that is very helpful. I am pretty sure now that it is a 19.5", though it will be a while before I get it built.